(Nanowerk News) With a bit of leverage, Cornell researchers have used a very tiny beam of light with as little as 1 milliwatt of power to move a silicon structure up to 12 nanometers. That's enough to completely switch the optical properties of the structure from opaque to transparent, they reported. The technology could have applications in the design of micro-electromechanical systems (MEMS) -- nanoscale devices with moving parts -- and micro-optomechanical systems (MOMS) which combine moving parts with photonic circuits, said Michal Lipson, associate professor of electrical and computer engineering. The research by postdoctoral researcher Gustavo Wiederhecker, Long Chen Ph.D. '09, Alexander Gondarenko Ph.D. '10 and Lipson appears in the online edition of the journal Nature and will appear in a forthcoming print edition. Scanning electron micrograph of two thin, flat rings of silicon nitride, each 190 nanometers thick and mounted a millionth of a meter apart. Light is fed into the ring resonators from the straight waveguide at the right. Under the right conditions optical forces between the two rings are enough to bend the thin spokes and pull the rings toward one another, changing their resonances enough to act as an optical switch. Light can be thought of as a stream of particles that can exert a force on whatever they strike. The sun doesn't knock you off your feet because the force is very small, but at the nanoscale it can be significant. "The challenge is that large optical forces are required to change the geometry of photonic structures," Lipson explained. But the researchers were able to reduce the force required by creating two ring resonators -- circular waveguides whose circumference is matched to a multiple of the wavelength of the light used -- and exploiting the coupling between beams of light traveling through the two rings. A beam of light consists of oscillating electric and magnetic fields, and these fields can pull in nearby objects, a microscopic equivalent of the way static electricity on clothes attracts lint. This phenomenon is exploited in "optical tweezers" used by physicists to trap tiny objects. The forces tend to pull anything at the edge of the beam toward the center. When light travels through a waveguide whose cross-section is smaller than its wavelength some of the light spills over, and with it the attractive force. So parallel waveguides close together, each carrying a light beam, are drawn even closer, rather like two streams of rainwater on a windowpane that touch and are pulled together by surface tension. 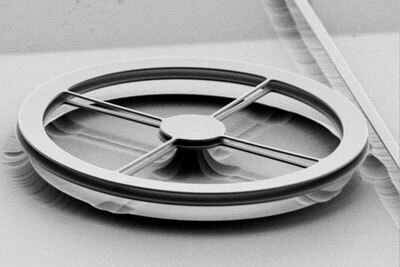 The researchers created a structure consisting of two thin, flat silicon nitride rings about 30 microns (millionths of a meter) in diameter mounted one above the other and connected to a pedestal by thin spokes. Think of two bicycle wheels on a vertical shaft, but each with only four thin, flexible spokes. The ring waveguides are three microns wide and 190 nanometers (nm -- billionths of a meter) thick, and the rings are spaced 1 micron apart. When light at a resonant frequency of the rings, in this case infrared light at 1533.5 nm, is fed into the rings, the force between the rings is enough to deform the rings by up to 12 nm, which the researchers showed was enough to change other resonances and switch other light beams traveling through the rings on and off. When light in both rings is in phase -- the peaks and valleys of the wave match -- the two rings are pulled together. When it is out of phase they are repelled. The latter phenomenon might be useful in MEMS, where an ongoing problem is that silicon parts tend to stick together, Lipson said. An application in photonic circuits might be to create a tunable filter to pass one particular optical wavelength, Wiederhecker suggested. The work is supported by the National Science Foundation (NSF) and the Cornell Center for Nanoscale Systems. Devices were fabricated at the Cornell Nanoscale Science and Technology Facility, also supported by NSF.